O'Bee Credit Union reconnected with its roots by coming out with a credit card that attempts to bring the Olympia Beer brand back to its local roots. O'Bee is of course the old brewery employees credit union, so its pretty fitting that they'd launch an Olympia Beer themed card. O'Bee as in O.B. as in Olympia Brewery. But, bringing back a local brand to its roots? 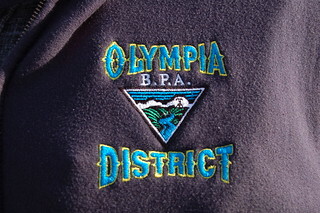 Sure, they stopped brewing Olympia Beer here years ago, but the brand itself hardly left. I started collecting examples of the use of the Olympia Beer font last November (well, I only have three so far), but they range from the local Bonneville Power Administration to a burger place on the westside. And, of course there is Olympia Lowlife and the Oly Rollers. That brand hasn't gone anywhere, its practically the most popular way to put the word "Olympia" in print.